Nikki is sure she's found her soul mate when she meets Dee. So what if they have a few rough patches in their relationship? They love each other, and they would do anything for each other, and that's all that matters. But then one day Nikki goes too far for Dee, and covering up for his crimes costs Nikki her best friend. Coming clean means that Nikki could lose Dee forever...but was he ever really hers to begin with? 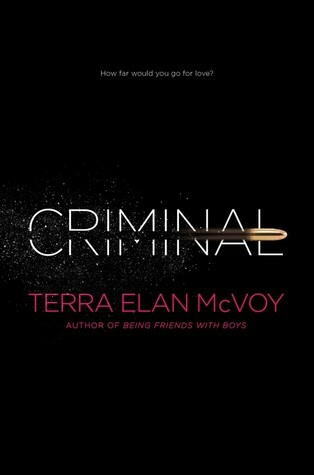 Terra Elan McVoy's latest book is quite a departure from her previous novels, but just as well-written and emotionally charged. Criminal is dark and edgy, but it doesn't shy away from the tumultuous experiences of Nikki's journey from a dependent, trod-upon girl who has struggled to find people in her life to depend on, to self-aware girl who takes responsibility for her actions. The novel follows Nikki closely, focusing more on her character development than the actual crime committed. Nikki struggles with the meaning of the word "criminal" and how it is applied to her, especially after she is taken into custody and lives in jail before her trial can begin. All of Nikki's experiences don't necessarily harden her, but they force her to open herself up to the reality of what happened with Dee, take responsibility, and find a strength she didn't know she had in her. Criminal is a tough novel to read, but an important story about friendship, broken trust, repentance, and finding responsibility and strength. Cover Comments: I love the black and pink, and the bullet. So striking, and so sharp!